Another critical need in the community revolves around the construction and condition of their homes. There are several objectives we are trying to address in building a model home. We want to use common construction techniques from the area. Villagers can provide the labor, but there are a number of materials that the foundation can supply that will significantly improve the quality of their homes and living conditions. Concrete floors vesus dirt floors. We want stucco interior and exterior walls over the adobe instead of crumbling adobe walls inside and out. Currently they don't have windows for natural light which also makes the houses cold during the days even with good sun conditions. We can also improve lighting conditions inside by incorporating skylights into the roof design. Prperly vented stoves instead of cooking over open fires inside will reduce smoke inside and significantly reduce the amount of respiratory disease and eye infections. There are currently no bathrooms or outhouses of any kind in the village causing a significant health risk. In the model home we will construct functioning bathrooms with a septic system. Bathroom will have a toilet, urinal and bathtub. With these needs and others in mind, we have been pursuing the construction of a model home to help the people see what type of home they could live in. We hope to be able to promote new construction and remodeling of existing homes where possible. We will develop a sponsorship program where donors from the U.S. can sponsor material purchases for families in Pirca. The first necessity is to produce enough adobe bricks for the construction. Here is a picture of an adobe assembly line in Pirca. Felix 6 years old stacking blocks. Adobes stacked up next to the site ready to begin construction. Rick from the Benson Institute reviews the progress of the model home with Zacarias and Javier during his first visit to Pirca. The walls are going up. Looking good! Installing beams for the second floor. Topped out with adobes and starting on the roof. Inside shot of the second floor with the roof going on. Roof complete with two skylights. View of the sky lights from inside. 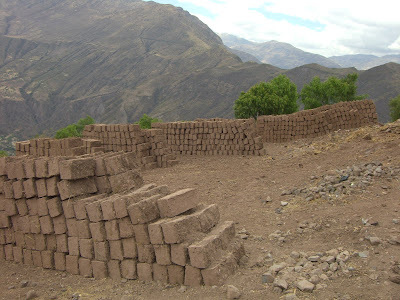 Pirca Project - A Labor of Love is a non-profit humanitarian service organization established to provide aid to small mountain villages in Peru. 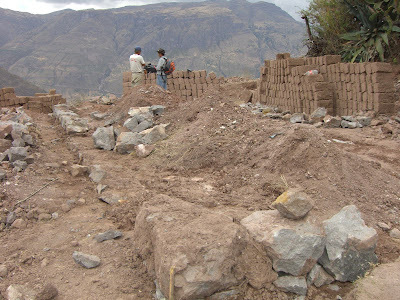 To assist the residents of Pirca, Peru, as a partner community to improve their current living conditions and to feel optimistic that they can build a great future through hard work and self reliance with some resource help from others. Our projects meet the long-term social, economic and environmental needs of the partner community. We will also build local knowledge and leadership at every stage of our work. This blog copyright © 2009 Project Pirca. All Rights Reserved.